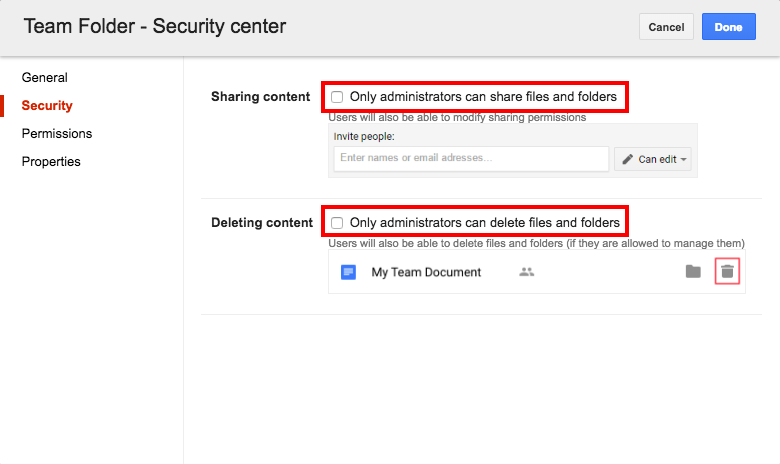 As a library administrator, you can access the Team Folder settings directly from Google Drive. 1. Access a Team Folder library as a library administrator. Name: Rename your Team Folder. Note: Don't use the Rename button in Google Drive to rename your Team Folder, as AODocs does not recognize it. Push the Team Folder into the Google Drive of the users who have access to it. Choose to send users an email notification informing them that a new Team Folder is added to their My Drive. Storage account: View the name of the storage account associated with the Team Folder. Activity report: Access the Team Folder’s activity report in the AODocs interface. This video shows how to define the options in the Security tab. Note: When typing an email address, AODocs will autocomplete with email addresses available in your G Suite domain global address list. 3. Press Add to add the user/group to the list of people authorized to access the Team Folder. 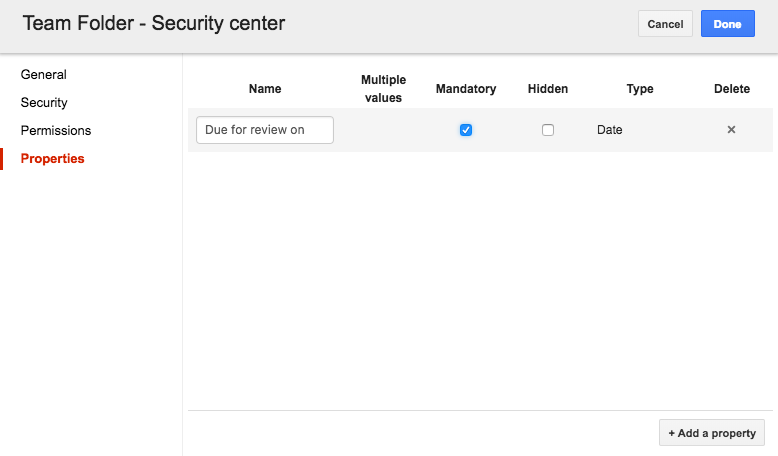 For existing users or groups, you can change their permission level or remove them from the Team Folder. Anyone can access the Team Folder and it can be found by search engines. This option is available only if such public sharing is enabled in your G Suite domain. Everyone with the link can access the Team Folder. URLs are not indexed, so can't be found by search engines; the URL is kept as private to all those it has been shared with. 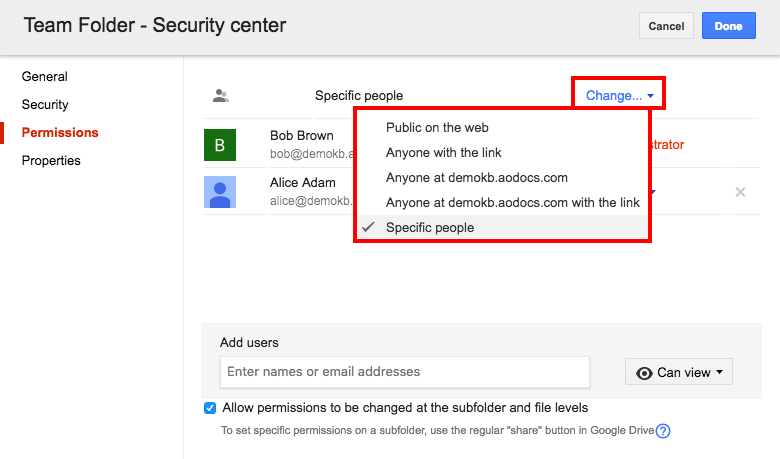 This option is available only if such public sharing is enabled in your G Suite domain. Everyone in your G Suite domain will have access to the Team Folder. The Team Folder will be listed on their AODocs homepage. 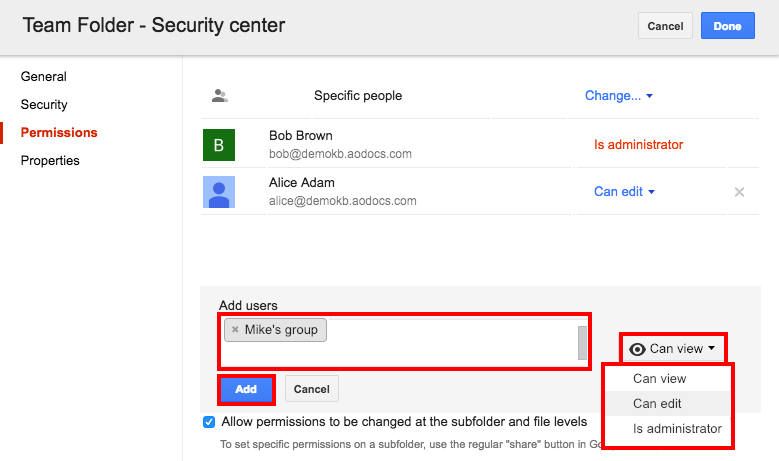 Everyone in your G Suite domain who has the link will have access to the Team Folder. 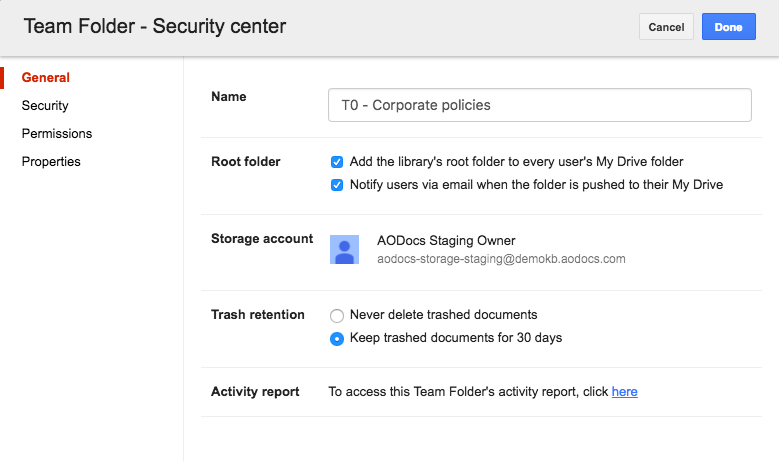 The Team Folder will not be listed on the AODocs homepage of users. Only the people added to root folder permissions will have access to the Team Folder root folder. The Team Folder will be available on their AODocs homepage. 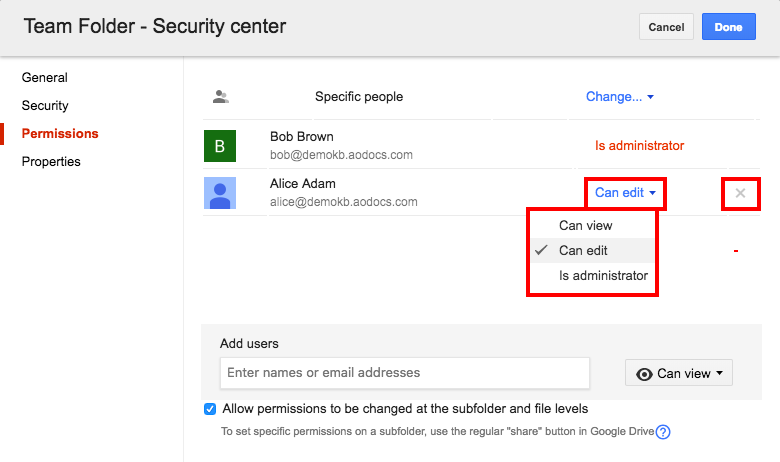 Use the checkbox Allow permissions to be changed at the subfolder and file levels to define a permission mode for your Team Folder. 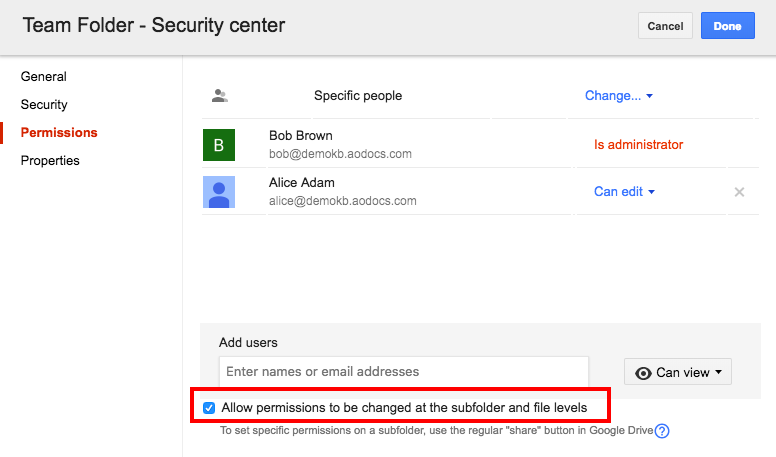 Users with sharing privileges can manage the permissions at the subfolder level and on individual files. Files take the permissions set at the library level and cannot be changed at the subfolder level or on individual files.